"But if we're looking for a reason to quarrel, historical policy is a best reason." 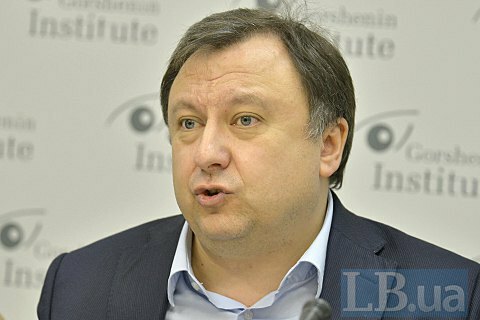 People's вeputy, a co-chair of the group of interparliamentary relations with Polandб Mykola Knyazhytskyy, suggests looking for a new formula of joint perception of the Ukrainian-Polish historical memory. "Few politicians in Europe are so willing to be our allies. Therefore, in face of the Russian aggression, we should not get angry and protest but seek opportunities for dialogue and search for a formula in this complex historical situation. If the formula "ask forgiveness and forgive," do not fits here then what it should be? It must be real, however, to lets us to move on together if we want it. If we are looking for an excuse to quarrel, the historical policy is the best pretext," he said at a roundtable in Gorshenin Institute on 9 February. Knyazhytskyy believes that Poland cannot force Ukraine to renounce its history. "When Mr. Kaczynski is laying flowers to the monument of Dmowski, eyebrows are rising in Ukraine because Dmowski believed that Ukraine shouldn't exist, so the veneration of Dmowski is perceived with pain in Ukraine. However, we understand that he was a Polish hero and a historical figure, just like Pilsudski. It’s the same with Bandera. It is obvious that there were other people in the UPA, who had opposing views, and there are people who fought on the other side. But all of this is part of our history. Can we give it up? No, we cannot, it is unrealistic and plain impossible, " said the lawmaker. "All we can do is to realize Polish concerns and fears because the Polish-Ukrainian tensions have touched upon many Polish and Ukrainian families. We can and must condemn any action against civilians, no matter who has committed them. If there is evidence that they were committed by the UPA, we shall talk about. We condemn the operation "Vistula" which in actual fact was an act of genocide. Likewise, we have to condemn the actions of the UPA, which led to victims among civilians, but we should not renounce the Ukrainian [liberation] movement," Knyazhytskyy said. Last December, President Petro Poroshenko in his speech in the parliament of Poland said that the dramatic past should not divide Ukraine and Poland. "We are inspired by the thoughts of primates of our churches who advised to speak with great wisdom on the tragic pages of common history during the Second World War and the first post-war years: 'Forgive and ask forgiveness,'" the head of Ukrainian state said. Last June, the first and third presidents of Ukraine Leonid Kravchuk and Viktor Yushchenko along with other prominent Ukrainians signed an open letter to Poland and Polish society in support of the above formula.